suggests that whatever correction term might be derived (see Sections 7.7 and 7.8), it should depend on the forward rate itself. Let us develop some further intuition as to the origin of this 'correction term'. For the sake of concreteness, let us assume that we are receiving the flows from the arrears FRA and paying the flows from the plain-vanilla, and recall that, with the naive hedging strategy, we have scaled the notional of the plain-vanilla by a fixed amount chosen at the outset. As pointed out after Equation (2.3), however, the mismatch in discounting directly depends on the rate /(i, freset, 'reset + r) that resets at time freset. At reset time, the outcome of this rate has no impact for the holder of the long/short strategy in so far as the term (/ — K)r is concerned, since this term is identical in the expiry specification of both contracts. At reset time, however, if rates have risen and the arrears FRA is therefore in-the-money, the plain-vanilla liability, paid in r years' time, is discounted by a 'large' discount factor, 1/(1 + /(freset, 'reset, 'reset + Notice that 'large' in this context means 'larger than the discount term P(tTeset, tTeset + r)/P(tKset, 'reset)'- When rates are low, on the other hand, and the arrears FRA is out-of-the-money, the plain-vanilla liability is discounted by a 'small' discount factor, 1/(1 + /('reset, 'reset, 'reset + r)r). 'Small', once again, means 'smaller than the discount factor /"('reset, 'reset + r)/P(tKset, 'reset)'- Due to the non-linear dependence of the discounting factor on the rate /, however, what is lost, from the perspective of the trader who entered the strategy described above, because of 'high' discounting when rates are low is not as large as what is gained because of 'low' discounting when rates are high. This asymmetric (non-linear) payoff is the reason for the need for a correction term; and the origin of the asymmetry, i.e. the covariance between the payoff and the discounting, is actually of very wide generality, as will be repeatedly shown in the following chapters. The linear term in f*r will provide a symmetric cancellation of the in- and out-of-the-money payoffs, but it is the quadratic term in (/*r)2 that will provide an asymmetric bias. 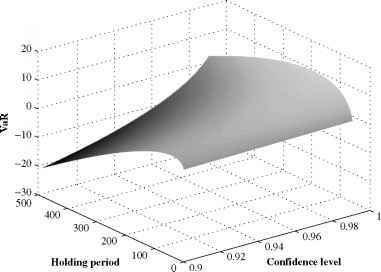 This finding agrees with the qualitative behaviour of Figure 2.4, and provides a rationale for the term 'convexity'. Finally, from Equation (2.4) one can readily tell that the longer the tenor r of the FRA, the more pronounced the correction term should be. This squares nicely both with the intuitive explanation of the origin of the effect given above, and with the empirical observation that, when these trades are put in place as a volatility play, they tend to be dealt in long (typically 12-month) tenors. We have said nothing about the likelihood of occurrence of the different shifts in yield curve levels used to obtain Figures 2.3 and 2.4. Whatever these probabilities might be, the magnitude of the effect, i.e. of the systematic gain of one contract over the other for a rigid curve shift, depends on the magnitude of the shift itself, as displayed by Figures 2.3 and 2.4. Invoking again plausibility, one would therefore feel justified in arguing that the 'expected additional PV' of the arrears contract should depend on the volatility of the yield curve in general. On a FRA-by-FRA basis, Equation (2.3) and the discussion thereafter indicate that the relevant quantity should be the volatility of each forward rate. Finally, since the receiver of the floating rate for the LIBOR-in-arrears FRA would make a consistent profit over the receiver of the plain-vanilla floating rate if the naive valuation formula (2.2) were used, the equilibrium rate for the arrears case (i.e. that value of the strike that gives zero value to the contract) should be higher than the plain-vanilla equilibrium rate. (iv) the origin of the correction term lies in the covariance between the payoff and the different discounting in the arrears case. The most salient feature of the LIBOR-in-arrears swap is the difference between the contractual stipulations for the payment of its payoffs (at reset time rather than r years later) and the similar stipulations for the plain-vanilla swap with the same resets. This feature is actually shared by a whole class of instruments, of which Constant Maturity Swaps (CMSs) are an example.3 In this latter case, in fact, the reset of, say, a 5-year semi-annual swap rate gives rise not to the 'traditional' payment which notionally spreads over the time to maturity, but to the same payoff that would have occurred if, say, a 6-month LIBOR had reset at the same point in time with the value of the 5-year rate. The reasoning carried out for LIBOR-in-arrears swaps can be repeated for the CMS case, and leads to the same conclusions about (i) the direction of the adjustment of the 'naive' projected rate, (ii) the dependence of this correction on the volatility of rates, and (iii) the covariance between the payoff and the discounting being at the heart of the adjustment. The case of 'unnatural' choices for discounting will be treated at length in the course of this book. In the meantime, it is hoped that the intuition which has been developed in this section will prove of help for future developments. In analogy with their European counterpart (see Section 1.5), American swaptions give the holder the right to pay (payer's swaption) or to receive (receiver's swaption) the fixed rate in a swap; in addition, however, the American feature grants the holder the right to exercise not at a single point in time, but during a continuum of dates (American) or on selected exercise opportunities (Bermudan). The Bermudan version is by far the more common, and is often referred to in the market simply as an American swaption. This imprecise but common usage is often adopted in this book, where no possibilities of ambiguity arise. Most frequently, Bermudan options are embedded in a swap or in a bond, turning them into cancellable or extendable swaps or bonds, respectively, as described below. A common financial use is to 'enhance' the yield of an investor, or to reduce the borrowing rate of an issuer. In the following we shall analyse the first case, keeping in mind that, mutatis mutandis, the same reasoning applies to the 'rate-lowering' type of products. The issuer, as we discussed, is the holder of a valuable option. In order to crystallise its value, however, i.e. in order to be able to translate the intrinsic and time value of this option into hard cash to pay the above-market coupon, the issuer would have to engage in a dynamic hedging strategy — perhaps based on one of the models presented later in this book — which he might be institutionally or technologically ill-equipped to carry out. As a consequence, the issuer will typically enter into a swap with a financial institution, whereby he receives the above-par coupon (or, in swap terminology, the above-plain-vanilla) rate F' in exchange for paying floating LIBOR (see Figure 2.5). A few points are worth noticing at this stage: first, a moment's reflection shows that the bank will, in general, exercise in exactly the same economic situations where the issuer would have exercised his right to call the bond. Therefore, from the investor's perspective, he is exposed to the same risk/reward profile that he would have experienced if the option had remained with the issuer. The investor is therefore indifferent to, and need not even know about, the further transactions which might have taken place between the issuer and the bank. Second, the issuer's cash flows completely 'wash through' between the bank and the investor, and the net result, from the issuer's perspective, is simply the raising of funds at the plain-vanilla LIBOR rate.4 All the market risk is borne by the investor (and, of course, the bank). Finally, since the rate received by the investor and paid by the bank must, by the very nature of the transaction, be above the par coupon (the plain-vanilla swap rate) the receiver's swaption held by the bank has intrinsic value at the outset, or, in other terms, is already in-the-money when the structure is put in place. The potential importance of this observation can be understood by analysing a specific case. Let us assume that the curve is downward sloping, and that the investor grants the issuer the right to call a 10-year bond on any coupon date after, say, 3 years. (Exactly the same considerations would apply, mutatis mutandis, for the 'mirror image' case of a funding cheapening trade with an upward sloping curVe scenario.) Since, for an American swaption, it is impossible to determine analytically what the equilibrium rate F' should be, let us approach the problem in an iterative way. We could, for instance, start from an initial guess for F' equal to the 10-year plain-vanilla rate F(10), and search by trial and error for a value F' that satisfies Equation (2.8). But we can already tell that our initial guess of F(10) for F' cannot be an equilibrium value from the swap 4- option structure, since the swap has, by definition, zero value at F<10), and the option must have a positive value. The initial guess F must therefore be raised to, say, F*. In so doing the value of the swap will be decreased by the quantity (F(l0) — F*) ^ Pit, f;+ i)r. The right to receive an above-plain-vanilla rate F* is, however, more valuable than an at-the-money swaption (or, in other terms, the option now has intrinsic value). Notice, however, that, since we have started the iterative search procedure in the neighbourhood of the at-the-money rate F, the delta of the swaption must have been approximately or, in present value terms, the receiver swaption will increase in value by about half as much as the (negative) change in the present value of the swap. Assuming that F* still gives a positive value for the bank for the sum of the swap and the option, the rate F* will have to be raised further to, say, F**. The opposite behaviour of the payer's swap and receiver's swaption will be present again, but notice that now, since the option has moved into the money, the delta of the swaption is greater than | and therefore the increase in value of the receiver's swaption cancels a proportionally greater value of the decrease in present value originating from the swap. Where the exact equilibrium value F' will turn out to be will, of course, depend on the value of the option and, therefore, ultimately on the exact shape of the yield curve and on the volatilities of the swap rates to maturities, but, in the scenario described, F' might turn out to be well above the 10-year rate F<10), perhaps close to the 3-year rate F<3). Prima facie, this might seem excellent for the investor, who appears to have succeeded in the almost alchemic task of transmuting a 10-year into a 3-year yield in a downward sloping yield environment. What has happened, however, is that the option might have become so deeply in-the-money as to be worth little more than its intrinsic value: the investor might well be receiving an almost 3-year yield, but he will do so for only 3 years, since the bank (the issuer) will almost certainly terminate the swap (call the issue) at the first exercise opportunity. The end result in this unfortunate but common case is that, in a very roundabout way, the investor has effectively invested his funds for 3 years at (approximately) the plain-vanilla 3-year coupon. This state of affairs is well known, and several attempts have been made by structurers to obviate these problems: step-down/step-up coupons or penalties upon exercise are amongst the most common. Instead of pursuing further this line of reasoning, the next section will present a different line of attack to tackle the problem, namely a structure which permits one to divorce, at least to some extent, the automatic termination of the swap from its being in-the-money. This will naturally lead to a discussion of trigger swaps. In the meantime, let us examine what determines whether and when a Bermudan swaption should be exercised by its ultimate holder (be it the issuer or the financial institution, as the case might be). A necessary condition, of course, is that the option should be 'in-the-money', i.e. that the equilibrium rate to swap maturity, FA, prevailing at the time of the ith exercise opportunity, tex (i), should be lower than F'. This condition, however, is not sufficient: by exercising the option the holder gives up the right to exercise at the subsequent opportunities, and it might be that the profit from its intrinsic value, (F" — FA)J2k P(hy. (i), tk+i)^, is less than the value of the forfeited options. Whether or not exercise should take place therefore depends on the indications from a valuation model such as one of those described in Part Four, the decision will, in general, be a function of the volatility of, and the correlation among, the swap rates to maturity, of the shape of the yield curve, and of the degree of 'in-the-moneyness'. The function Fbound (¿ex (i)), which gives, for each exercise opportunity tex(i), the swap rate level below which it is optimal to exercise, constitutes the so-called 'exercise boundary' function. If the early exercise boundary were known, the more difficult American problem could be reduced to a much simpler pseudo-European problem, since, at the boundary, the European and the American options have exactly the same value. The evaluation of the present value of the American option could then be tackled, as shown later, by relatively simple backward induction procedures. Even more simply, a Monte Carlo procedure could be employed, with the proviso that each simulation should not be allowed to go any further if the early exercise boundary is reached or crossed.5 Therefore, the evaluation of the exercise boundary is the problem in American options evaluation. Needless to say, this optimal level is a function of the particular valuation model employed. In general, a model that allows greater variability for swap rates will assign greater value to future exercise opportunities, and will consequently require the intrinsic value (F' — FA) ^ P(/ox(i)> h+\ to be higher before the compensation for the forfeited options will be deemed sufficient; in other terms, a higher swap-rate volatility model will push the exercise boundary further and further into the in-the-money region. Without entering into the details of the hedging procedure, it is intuitive that some cocktail of the 'underlying' European swaptions (i.e. the European options to enter swaps with the same final maturity and start at the various exercise times) should be regarded as the 'natural' hedging instrument. It is therefore essential, when pricing this type of option, to ascertain that the model chosen, which will typically take the short rate or a set of forward rates as driving variables, is capable of obtaining the implied swap rate volatilities in a convincing manner. The difficulties connected with the simultaneous recovery of cap and swaption volatilities are dealt with in Chapters 3 and 4, and at greater length in Chapter 18. Intuitively, however, one can already venture to guess, from the above discussion, that the precise recovery of the desired swap rate volatilities should be more important than the exact pricing of caps (more closely linked to the volatility of the short rate, and exactly determined by the volatilities of the different forward rates). How the situation changes and becomes more complex in the case of trigger swaps is explored at length in the following section.